Mid-Antrim ‘150’ road race set for 2016 return with new April date? Sam Wilson on his way to a 125 win at Killalane. Picture: Roy Adams. The Mid-Antrim ‘150’ could be set for a return to the Province’s road racing calendar next year - with a new early-season date. Talking to some of the Mid Antrim club members at Killalane at the weekend, the Clough-based race looks like it going to back on the cards in 2016 after not being held this year. Michael Dunlop brakes down into Kearneys Tree on his way to a win in the Grand Final. Picture: Roy Adams. It was felt amongst the club members that the meeting was suffering from the mid season glut of road races, with Armoy, the Ulster Grand Prix and the Mid Antrim on successive weekends, not mention the close proximity to a few of the Southern ones as well. Mid Antrim club have applied for the dates of April 1-2, making it the first road race of the year. The club are also speaking to a new title backer, the first time since the mid 1980s that the meeting would have a title sponsor. I must stress that the date change still has to be ratified at MCUI level, but it looks like our local meeting is coming back. Glarryford man Barry Davidson took two Classic wins at Kirkistown on Saturday. Picture: Roy Adams. Speaking of the Mid-Antrim club, this coming weekend, Global Oils will sponsor the latest round of the Mid Antrim Trials series, at Upper Shilnavogey, near Broughshane. To be known at the Global Oils Autumn Trophy Trial, the event, which will be closed to club, will get under way at 11am. It will also be the third round of the Michelin Mid Antrim series. Meanwhile in last weekend’s action at Kirkistown, Crumlin’s Ryan Rainey was in top form when he took a couple of handy wins in the Superbike class. He was always ahead in both races, winning the first by almost 8 seconds from Alistair Kirk and Philip McNally. Rainey was unstoppable in the second race as well, this time second placed Alistair Kirk left Raymond Casey well behind after Philip McNally toured back to the pits after a single lap. If the Superbike races were somewhat processional, the Supersport 600 was anything but. Robert English recovered from a slow start to take the win in the first race, while Robert Kennedy just got the better of early leader Jason Lynn for second. It the same story in race two, with English starting badly, but by halfway he had moved into the lead. Jason Lynn and Dundrods Robert Kennedy were bumping elbows again, with Lynn getting the drop on the Dundrod man on the final lap. Local riders Christian Elkin and Ross Patterson were the men to deal with in the Supertwins events. Patterson led the first one until Elkin went ahead. Before long Patterson had regained the lead, which he held to the finish, winning by .4 of a second. Kia McGreevy was third. Elkin got the better of Patterson in race two, this time taking the win by just .2 of a second. Kia McGreevy had another third place. Antrims Luke Hazlett won both Production twins races. Hazlett opened a gap of 1.4 seconds on second man Chris Hillis, while Drogheda’s Mark McConville was well in touch in third place. Race two was pretty much a rerun of the first encounter. Hazlett won from Hillis, while Kevin Baker got the better of McConville for the final podium step. Despite shaving .3 of a second off his own lap record for the Pre Injection class, Andrew Brady couldn’t work with Bangor man Stevie Titterington. Titterington made the break right from the turn of the lights and no matter what Brady threw at him, he was able for it, winning by almost 6 seconds. Jonny Aiken was well off the pace in third place. Doubling as the Crown Prince of Kirkistown, the second PI race also went to Stevie Titt. Jonny Aiken took runner up after Brady slipped off, unhurt. Steven Clark was third. The FE1 races both went to Charles Stuart. The Ballycastle man left Chris Campbell for dead both times, winning the first by over 15 seconds. Parkgate man Peter Fletcher had a start to finish win in the opening SS400 race. He was never really under any pressure, as he took the race win by 2.5 seconds. Ballymena man Kirk Dickey was on a charge in the latter part of the race, but despite setting the fastest lap of the race, could do nothing about Fletcher. Eoin Collins worked hard for his third place. Dickey got the better of Fletcher in the second race, while Collins again finished in third place, less than a second back. Glarryford man Barry Davidson won both Classic races, both times from George Stinson and Mark Johnston. A difficult season for everyone associated with road rcaing came to a conclusion as the Loughshinney club hosted the Country Crest Killalane meeting, which was affected by a few, thankfully none too serious red flag incidents. Michael Dunlop was in top form in the Superbike classes. He took the win in the Grand Final, after coming from behind Derek McGee. Derek Sheils led the 201-1010 championship race, but before long Michael slipped by and moved away to win by over 5 seconds. William Dunlop had to deal with Derek McGee, but was able to go ahead and take third place. As Michael was in top form in the Superbike races, elder brother William was dominant in the 600 class. He took the championship race from Derek McGee and Seamus Elliott. The earlier non title race was a bit closer for the Ballymoney man. Seamus Elliott had moved to within a second but that was the best he could manage. The Supertwins race was close. Derek McGee led from start to finish but Connor Behan never gave up. Never able to get ahead, Behan was .4 back at the line, the top two having broken away from Michal Dokoupil, who was riding for the Ballymena based RT&E team. Davy Morgan was the start to finish winner in the 250 class. Just home from the Manx Grand Prix, Ballymena man Neil Kernohan pulled back to second place, but the red flags went out before the local man could get his head down to chase Morgan. Michal Dokoupil led the 400 class until Seamus Elliott took over. Skerries man David Howard, Indi’s main rival for the 400 championship, was back in third. When the red flags were hung out there was 50% of the race distance completed. 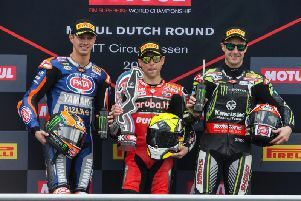 The race organisers decided to award half points which would have given the title to the Czech rider on countback, as he and Howy were tied on points. Indi had 3 race wins to Howy’s one. I’m not too sure what the state of play is, as I understand Howy lodged a protest. Ballymena man Sam Wilson was a start to finish winner in the 125 race. Riding the Joeys Bar Honda, the local rider took the win over Sam Dunlop by 2.9 seconds. Dunlop, Nigel Moore and Neil Kernohan were together all race, finishing in that order, just .4 separating them at the line.